This chemistry dictionary offers the chemistry definitions starting with the letter V. These glossary terms are commonly used in chemistry and chemical engineering. Click the letter below to find the terms and definitions beginning with that letter. vacancy – Vacancy refers to a lattice site that is normally occupied by an atom or ion which is missing that atom or ion. vacuum – Vacuum is a volume that encloses little or no matter. A partial vacuum is an enclosed volume with low amounts of matter. A total or absolute vacuum is an enclosed volume no matter enclosed. val – Val is an abbreviation for the amino acid valine. Valine is also abbreviated as V.
valence – Valence is the number of electrons needed to fill the outermost shell of an atom. Because exceptions exist, the more general definition of valence is the number of electrons with which a given atom generally bonds or number of bonds that can form with the atom. Examples: A neutral carbon atom has 6 electrons, with an electron shell configuration of 1s22s22p2. Carbon has a valence of 4, since 4 electrons can be accepted to fill the 2p orbital. valence band – The valence band is the highest energy level containing an electron of an atom in its ground state. valence bond theory – Valence bond theory is a chemical bonding theory that explains the bonding between two atoms is caused by the overlap of half-filled atomic orbitals. The two atoms share each other’s unpaired electron to form a filled orbital to form a hybrid orbital and bond together. Example: Sigma and pi bonds are part of valence bond theory. valence electron – A valence electron is an electron that is the most likely to be involved in a chemical reaction. They are typically the electrons with the highest value of the principal quantum number, n.
Examples: Magnesium’s ground state electron configuration is 1s22s2p63s2, the valence electrons would be the 3s electrons. Bromine’s ground state electron configuration is 1s22s2p63s2p6d104s2p5, the valence electrons would be the 4s and 4p electrons. Valence Shell Electron Pair Repulsion Theory – Valence Shell Electron Pair Repulsion Theory (VSEPR) is a molecular model to predict the geometry of the atoms making up a molecule where the electrostatic forces between a molecule’s valence electrons are minimized around a central atom. Example: According to VSEPR theory, the methane (CH4) molecule is a tetrahedron because the hydrogen bonds repel each other and evenly distribute themselves around the central carbon atom. vanadium – Vanadium is the name for the element with atomic number 23 and is represented by the symbol V. It is a member of the transition metals group. Van der Waals bond – A van der Waals bond is a secondary interatomic bond between adjacent molecular dipoles. A van der Waals bond may be permanent or induced. Van der Waals forces – Van der Waals Forces are the weak forces which contribute to intermolecular bonding. Van der Waals radius – The Van der Waals radius is equal to one-half the distance between two unbonded atoms when the electrostatic forces between them are balanced. van’t Hoff rule – Van’t Hoff Rule is a method of predicting the maximum number of enantiomers of an optically active molecule: 2n, where ‘n’ is the number of stereogenic centers. vapor – Vapor is a condensable gas. Examples include air, steam, oxygen and any other gases which may be condensed into liquid form. vapor pressure – Vapor pressure is the pressure exerted by a vapor in equilibrium with the solid or liquid phase of the same substance. An alternate definition is the partial pressure of the substance in the atmosphere above the solid or the liquid. vaporization – Vaporization is the phase transition of a substance from the liquid phase to the gaseous phase. vector – In physical science and engineering, a vector is a geometric object which has both magnitude or length and direction. A vector is commonly represented by a line segment in a specific direction, indicated by an arrow. Vectors are typically used to describe physical quantities which have a directional quality in addition to a quantity that could be described by a single number with a unit. Examples: Velocity and force are vector quantities. verdigris – Verdigris is a thin layer of corrosion that appears on copper, bronze, and similar metals due to exposure to weather or aging. Patina is typically made up of oxides or carbonates. vertical ionization energy – The vertical ionization energy is defined as the amount of energy required to remove an electron from an atom, molecule or ion without changing the atom, molecule or ion’s geometry. very high frequency – Very high frequency (VHF) is part of the electromagnetic spectrum in the radio waves region with frequencies between 30 and 300 Hz. Examples: FM radio and television signals use the very high frequency range. very low frequency – Very low frequency (VLF) is part of the electromagnetic spectrum in the radio waves region with frequencies between 3000 and 30000 Hz. Examples: Very low frequency waves can penetrate water up to approximately 40 meters making them useful to communicate with submarines. VLF waves are also used for radio navigation for aircraft. vicinal – Vicinal is a term used to describe the location of two identical chemical groups or atoms which are bonded to adjacent carbon atoms. vinyl group – Vinyl group is the CH2=CH- group. viscoelasticity – Viscoelasticity is a type of deformation which exhibits the mechanical characteristics of viscous flow and elastic deformation. viscosity – Viscosity is the consistency of a moving fluid and its resistance to deformation. It is defined as the ratio of the magnitude of an applied shear stress to the velocity gradient that it produces. vitamin – A vitamin is a biochemical compound necessary in small amounts for the function of an organism. Vitamins must be obtained externally when the organism cannot synthesize enough of the compound on its own. vitiated air – Vitiated air is air with oxygen removed or contains very little oxygen. Example: The upper atmosphere is vitiated air. vitrification – Vitrification is the process of converting a material into a glassy amorphous solid that is free from crystalline structure. This can be achieved through the addition of heat or introduction of an additive. Vitrification occurs at the glass transition temperature which is lower than the melting point. vitriol – Vitriol was an alchemical term for a sulfide of a metal. Vitriol is also the historical name for sulfuric acid (H2SO4). In alchemy, sulfuric acid was called oil of vitriol. volatile – Volatile refers to a substance that vaporizes readily or as a measure of how readily a substance vaporizes. volt – The volt is the SI unit of electromotive force. One volt is the force necessary to maintain a current of 1 ampere across a resistance of 1 ohm. The symbol for volt is V.
voltaic pile – A voltaic pile is a type of electrochemical battery that generates electric charge using a series of alternating dissimilar metals separated by paper or cloth soaked in an electrolyte solution. volume – Volume is the quantity of three-dimensional space occupied by a liquid, solid, or gas. Some common units used to express volume include liters, cubic meters, gallons, milliliters, teaspoons, and ounces. volumetric flask – A volumetric flask is a type of laboratory glassware used to prepare solutions. 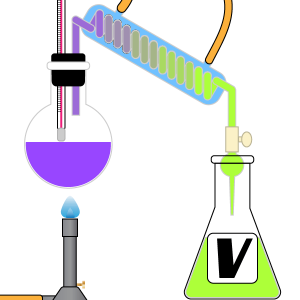 A volumetric flask is a flat bottomed bulb with an elongated neck calibrated to hold a preset volume at a mark on the neck. volume-volume percentage – Volume-Volume percentage (v/v %) is a measure of the concentration of a substance in solution expressed as the ratio of the volume of the solution to the total volume of the solution multiplied by 100%. Example: Wine has a typical value of alcohol content v/v % of 12%. This means there is 12 mL of ethanol for every 100 mL of wine. vulcanization – Vulcanization is a nonreversible chemical reaction between sulfur or another agent and rubber in which cross-links are formed between the molecular chains in the rubber.